Handling heavy or awkward-shaped loads can be labour-intensive, time-consuming and dangerous. Guidelines and legislation, such as The Lifting Operations and Lifting Equipment Regulations 1998 (LOLER), are in place to help encourage safer lifting practices to take place. But accidents and fatalities involving lifting equipment do still happen, and it’s often because organisations processes aren’t fully safety compliant. According to the Health and Safety Executive, lifting and handling (27%) and being struck by a moving object (12%) are among the top three causes of non-fatal injuries. It’s also not uncommon for companies to use the wrong lifting equipment either. When using forklifts and lift trucks, this can result in the vehicles overturning, loads falling and collisions. 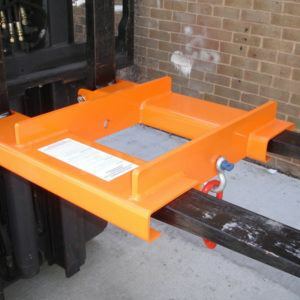 This hook provides a quick and economical method of lifting and positioning unpalletised loads. Multiple lifting positions can be achieved by correctly positioning the attachment along the fork blade. These beams are specifically designed for safely removing battery boxes from forklifts. Supplied as standard fork-mounted, they can also be manufactured with a lifting eye for overhead cranes. Multiple lifting positions can be achieved, simply by using this attachment. 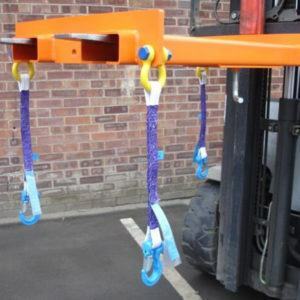 These hooks provide an economical and safe method of converting a forklift truck into a mini mobile crane. This crane/excavator slung spreader beam is the ideal attachment for lifting and laying rolls and liners on landfill sites, man-made ponds and bankings, etc. Once the forks are driven into the pockets, the automatic mechanism locks itself to the telehandler forks when elevated. This means there’s no need for the forklift driver to leave the safety of his cab during the lifting or emptying phase. We’ve taken you through some of our standard forklift attachments that are used across multiple companies and industries to safely lift and shift products and materials. There are, of course, our bespoke forks and attachments to add to the mix too. Like the set of forks we manufactured with machined edges for one of our clients, who experienced difficulties with lifting 1,000kg ‘big bags’ off their pallets and were concerned about the bag handle loops slipping off the forks (read the full details). 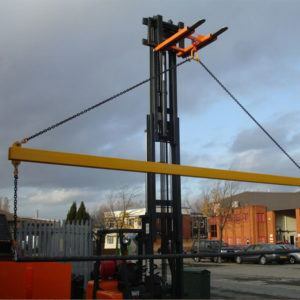 When it comes to handling loads, lifting is an integral part of most daily operations, but unfortunately, there’s a considerable amount of risk attached to it. 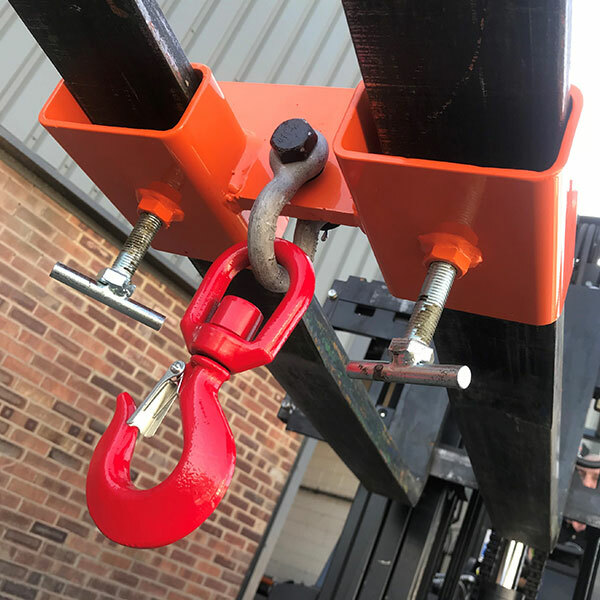 To find out more about how our forks and attachments can help improve your lifting processes and meet legislation, such as LOLER, contact us on 0113 277 1222 or sales@invicta-attachments.co.uk.